Gas hedge trimmers are a great tool to keep your yard in check, but it can be hard to figure out which one will work best for your needs. There are a lot of variables that can really affect how a gas trimmer can be used. You need to do your due diligence when searching for any yard equipment, just as you would if you were searching for the best ﻿fertilizer spreader or a great brush cutter. Here are the main things you need to pay attention to if you’re in the market for a new gas hedge trimmer. Keep in mind that these are not the same things you would look for in an electric hedge trimmer, although a few of them might be similar. Hedge trimmers are the same as weed whackers in that they take different mixes of oil and gasoline depending on the type of fuel needed for the engine. You may have a preference for the type of mixed fuel needed, because some types are cheaper and more easily available than others in your area. Plus, some fuel types come pre-mixed while others needed to be mixed by you as you refill your hedge trimmer. Gas trimmers are going to be heavier than electric trimmers, but that doesn’t mean you can’t find some that are lighter than others. A lighter trimmer would be great for a larger yard, but you do need to consider that the stronger trimmers are usually heavier as well. If you need more power, you will probably end up with a heavier trimmer. If don’t need as much power, you can get a lighter trimmer. Trimmer heads come in different sizes. 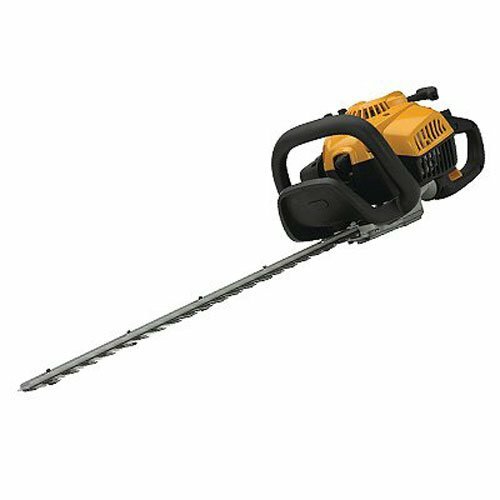 Some can be swapped out for larger or smaller heads, but a basic gas hedge trimmer is not adjustable as far as size. Choose a head size that’s going to work for your yard and any new additions you may be interested in making in the near future. You will have to deal with some level of noise no matter what kind of trimmer you choose, but you can find some that are quieter than others if you have any issues with noise levels. Lower power trimmers will probably be quieter than higher power trimmers, because the engine will be smaller. However, some brands are specially engineered to cut down on noise, so you can keep an eye out for that feature on the trimmer you’re interested in. Most hedge trimmers come with a warranty, but you will want to make sure that you get a great deal on your warranty. The best warranties will be 2+ years, so that you know it will last more than one season for the price you’re paying. That’s a great way to give yourself peace of mind when you’re working on your yard, especially because this is a big-ticket yard appliance that you don’t want to buy more than once every few years if necessary. A device that can lock in the lock position at your desired speed makes your job easier when you’re working outside. You can also have a higher level of safety if the device can lock in the off position, because kids and pets won’t be able to accidentally turn the trimmer on when it’s resting or stored. Here is a selection of some of the best gas hedge trimmers you can find. I will talk about the basic features of the trimmers, who they might be useful for, and what the pros and cons are of each of these products. My goal here is to give you a good idea about what’s out there and which trimmer might be best for you and your needs. Rather than being limited to only hedge trimming, this gas trimmer has multiple attachments in the set. It includes a hedge trimmer, bar pole cutter, and a pruner. This makes it a versatile piece of gear for your whole yard. Instead of needing to own a whole collection of appliances, you can just get this and take care of everything with the same device. With the arms fully extended, this trimmer has a reach up for 12 feet, which is quite a lot longer than a lot of similar tools. If you have a lot of yard work to do or a diverse garden environment, this is a fantastic tool for you. This Poulan gas hedge trimmer is a little monster of a machine the will absolutely get the job done if you want to clean up the hedges and bushes around your yard. It’s not meant to be used in a commercial capacity, but for the average homeowners with any sort of shrubs or hedges to deal with, this is a good choice for yard maintenance or shaping projects. Some homeowners might find the 15-pound weight to be too much for extended use, which makes it a bad choice for anyone that needs a lighter tool or who has an enormous yard to work with. The flexibility of movement is convenient, but carrying the machine around without a shoulder strap or other support will get tiring if you’re working in a large space. Husqvarna is generally known for high quality, reliable tools that will work well in your yard. 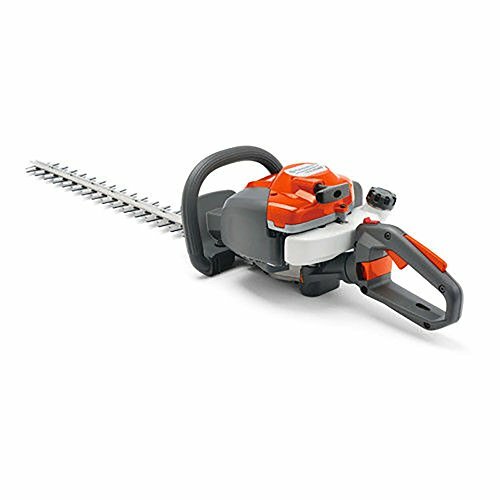 This hedge trimmer is no exception, and it’s sure to last you a long time once you start it up in your yard. You can take care of any yard maintenance and hedge trimming with this machine, even though it doesn’t have quite as much power as a few oth﻿er tri﻿mmers. It is, however, a lot lighter because of this and has a few extra features that make it more convenient for some users. One problem that seems unique to this hedge trimmer is that the products sometimes come with errors from the factory. Some machines come unable to start from the box, and you may need to mess with it a little bit or take it be get repaired in order for it to start up. This may be inconvenient, but it is generally covered by the warranty so it won’t be any extra cost to you to fix it up and get it working. In my opinion, the Poulan hedge trimmer set with the bar pole cutter and pruner is the best gas hedge trimmer available. It’s very convenient to have to capability to exchange the head for a different functioning attachment at any time, because it makes the machine a one size fits all tool. Although it’s a bit heavy, it’s powerful, has a good warranty, and won’t be too loud for you as you’re working in the yard.